Though known for its quality beef, this steakhouse also serves up good seafood. : Along with the trademark caricatures of local notables and celebrities lining the walls, diners will find a familiar steakhouse ambience at each location of this upscale chain. 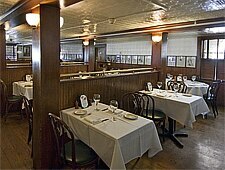 The food runs to outsize portions of USDA Prime steaks and lobster, along with straightforward salads and sides such as the Half & Half, cottage fries and fried onions, a classic iceberg wedge and the famous "Gigi" salad, a Palm specialty combining shrimp, green beans, onion and bacon, tossed with lettuce and vinaigrette. A range of chops, fish (broiled, blackened, sautéed or peppercorn-crusted) and Italian dishes is on hand for those looking for an alternative to the beef. This is all complemented by a standout New York cheesecake and a notable wine list. The white tablecloth atmosphere is reflected in the hefty tab.